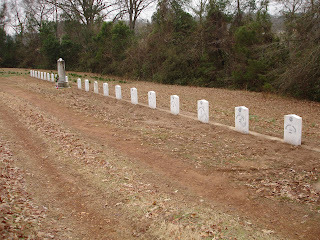 In the old section of the Minden Cemetery, in the back right corner marks the graves of over 20 unknown Civil War Confederate Soldiers. This hallowed ground of 144 years has never been forgotten. Even though the soldiers names may be lost forever to the future, their lives are remembered for their bravery and valor in April of 1864. These men more than likely were from the Walker Texas Division and General Polinac's Division of Louisiana. During the bloody and furious battles of Mansfield and Pleasant Hill these men were wounded and brought to Minden to be treated for their wounds. Both of these divisions had been in Minden before, a few months earlier, they had wintered in or near Minden in 1864. These men had family and these men were loved just as the 100’s of soldiers that fought with the Minden Blue’s and other regiments from our area did. Like so many Civ il War soldiers many were lost and never heard from again. They are somewhere across these United States buried in unmarked graves or left to scatter to the wind over 144 years ago. Many a loved one would only hope that their dear departed would have been laid to rest with the respect that the long plot in the Minden Cemetery represents. A few years ago, through genealogy research, one of these unnamed men would be identified by his family. 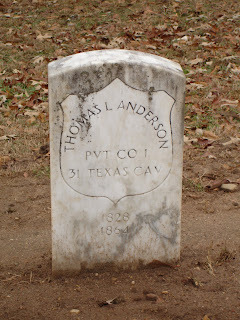 Thomas L. Anderson PVT CO 1, 31 Texas Cavalry 1828-1864 was finally found by his family and given a grave marker to tell the world who he was. Unfortunately the rest are still unknown but not forgotten. In 2007 the T.M. Scott Camp of Minden’s Son’s of Confederate Veterans wanted to do something to honor these men. 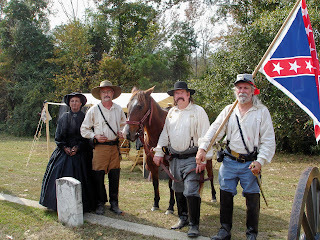 The groups of men are direct descendants of Civil War Confederate Veterans. They along with many other Civil War Camps across the country teach living history lessons in the forms of battle reenactments and encampments. They also take on the cemeteries as projects; dedicating markers and helping descendents locate possible burial sites of unknown soldiers. They are seen in parades and also have Civil War galas where you have the opportunity to step back in time and listen to authentic Civil War music, dress in hoop skirts and dance to the Virginia Reel. With the help of the Veteran’s Administration the forms were completed. The 21 stones were delivered on a large pallet weighing over 5000 lbs., earlier this year. Camp members from Minden, Claiborne Parish and El Dorado, Arkansas came together a few weeks later. Those member included Robert Vance, Bobby White, Jeff Scarlett, Jeff Earl Scarlett, Gator McDade, Ethan Powell, Roger Pittman, Ronnie Sale, Crystal Vance and Barry Watson. In one day of hard back-breaking work all the stones were put in place. After 144 years these men finally have a head stone to show that they are there. Saturday March 29th, 2008 at 1:00 PM a dedication ceremony will take place at the Minden Cemetery located In Minden, Louisiana on Bayou Avenue off Pine Street. The public is invited to see this unique, living history lesson. Sons of The Confederacy Camp members from El Dorado, Shreveport, Claiborne, Ruston, Farmerville and West Monroe are expected to participate in this long awaited event. Civil War attire if at all possible but is not required to attend. This will be a wonderful time to show children what history a cemetery holds and how important remembering the past is for our future. Turn out large in spite of Saturday’s weather for living history lesson. 150-200 visitors paid their respects Saturday March 29th at the Minden Cemetery marker dedication for the 21 unknown War Between the States soldiers. These men have been buried without an individual marker for 144 years. If you didn’t make it to the dedication ceremony Saturday you missed an historical moment in Minden’s history. The T.M. Scott Camp of Minden’s Son’s of Confederate Veterans along with members of many other camp’s from the Ark-La-Tex came together to honor and pay homage to men that have not been forgotten for nearly 150 years. This living history lesson was officially the start of April as Confederate History Month in Minden, as was stated by a proclamation from Mayor Bill Robertson’s office. This proclamation was read by executive assistant to the Mayor Mrs. Wanda Pittman in the absence of Mayor Robertson, due to his recent illness. Other dignitaries were on hand including; councilmen for the Army of Trans Mississippi, Mr. Chuck McMichael which is a representative for every camp this side of the Mississippi River. The ceremony was a moving experience for many that have worked long and hard to see this project from beginning to end. The site of the rider-less mule being led down the dirt road, with a pair of soldier’s boots turned backwards in the stirrups was a reminder of what the real meaning of the day was all about. The somber procession of soldiers marching down the dirt road and past the “Trench” carrying the many flags of the era was a moving site to behold. As a cannon fired and a volley of gunfire was sounded the sounds of Taps was heard in the distance from a lone bugler. 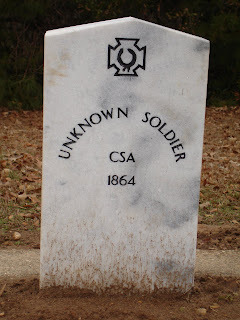 A rose was then laid at the stone of each of these unforgotten soldiers by some members of the United Daughter’s of the Confederacy the order of Confederate Rose and even a small child dressed in period attire. 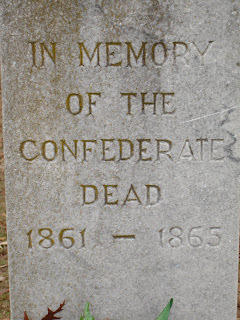 A Channel 12 reporter was on hand to capture this important event for Minden’s History and as he interviewed the crowd he learned a little bit about how important history is to our area and how important the upkeep of cemeteries as part of a community’s history is. Schelley Brown, executive director of the Dorcheat Historical Association Museum and member of The Minden Cemetery Association Board was on hand to participate and comment. “I think what Barry Watson and all the others have done here today to remember these men a very commendable act. It took a lot of hard work and dedication to see this project from start to finish and I am so glad that today’s turnout was wonderful in spite of the rains earlier in the morning. This type of event is what members of this group and I want to continue as a teaching tool for our community.” If you missed Saturday’s program a DVD of the event will be available please contact Schelley Brown at 423-0192 for more information.